My next exhibition will be at South Hill Art Centre in Bracknell the the preview is on the 7th September. It’s a lovely space and you will be able to see a collection of my new works on display. The Diptych Project is a collaboration between selected MA print artists and artists associated with Spike Print studio in Bristol. The diptych is a piece of art made up of two parts like a triptych but with only two parts to complete it. They have often been associated as a traveling altar and in many cases will have a hinge in the middle so they can close like a book. The choice of artists was drawn out of a hat and I am working with the very talented Maxine Relton, Spike Print associate and RWA affiliate. We have decided to creatively destroy and adapt each others work using the postal service we have started to send eight small pieces back and forth and working on top of what the other has added. We are working with themes of history and transformation as we both had a common interest in the way narrative can be held in a wall through the effect of time and the continuation of applied surfaces and destroyed surface. That every space has a life, and story of it’s own. The pieces are small however, at each stage we are scanning them in at a very high resolution and the final work will be enlarged with the use of high quality ink jet printer. These will be editioned in either digital or hand printed methods. The Project is very exiting and has been a great chance to experiment with collage and printing and all finished work will be exhibited at Spike Island in December. Keep an eye out on these posts and see how the work develops and changes on the lead up to it’s deadline. 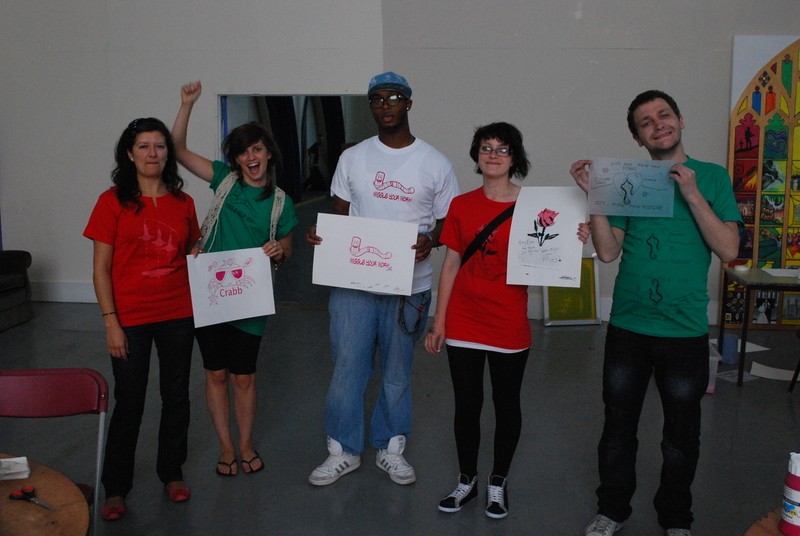 Stereograph will be doing a free screen printing workshop at tyntesfeild manner next tuesday. We will be making a screen printed piece in the style of a tapestry, inspired by Grayson Perry and Rauschenburg. The workshop is for 13-25 years old. If you or someone you know want to join in then you’ll have to book. Check out the poster! 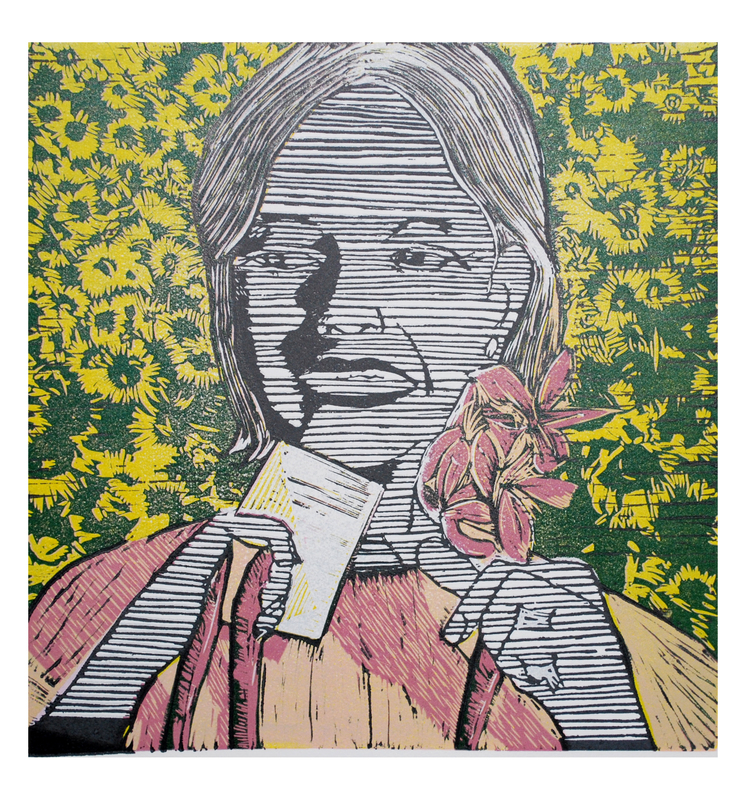 My New colour reduction relief print is taken from a photo of Aung San Suu Kyi after she was released from 20 years of house arrest for her human rights work. I have pictured her in front of a field of sunflowers which also links to Ai Wei Wei who has also been put under arrest for apparently speaking out against the state. This print is the start of my Modern day Icons work and I have sent one to Hong Kong to submit for the Hong Kong Graphics art fiesta so am keeping my fingers crossed. 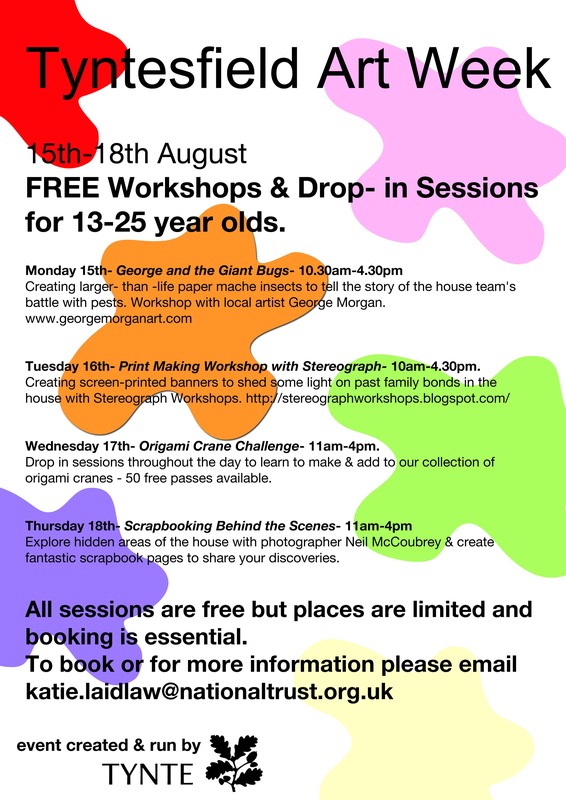 It is my absolute pleasure to announce that Stereograph our amazing mobile photographic screen printing workshop has had a very successful first workshop working with the Homeless Young people looked after by the charity Independent people. It was a great first run through in which participants started with drawn designs which where then carefully enhanced with our digital station and exposed perfectly with our super unit onto screens. 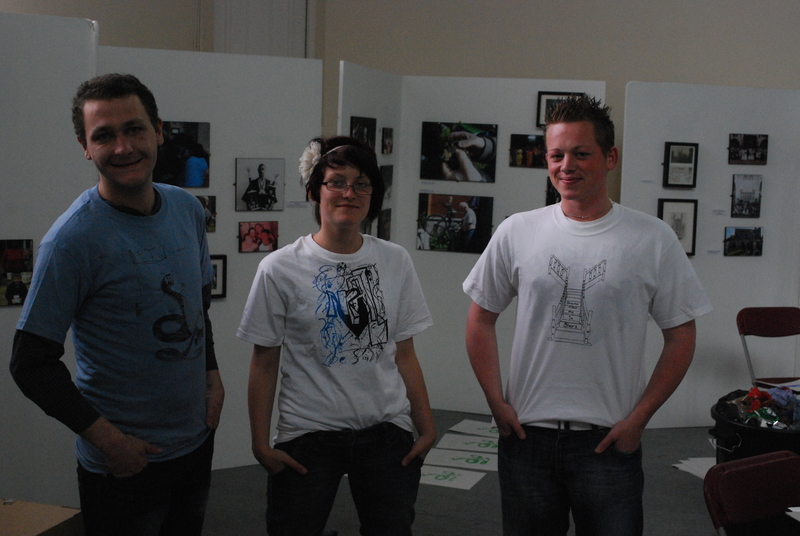 The group then learnt the basics for registration to edition prints on paper and then took their marvelous designs and print them onto great t-shirts which I’m very happy to say where then stylised and adapted to look very cool indeed. A lovely group to work with and every one had a really great two days and stayed well out of trouble. There was even one of the charity workers seven-year old daughter who got a chance to draw a lovely picture and print it onto her dads T-shirt for his birthday. Ace! So we’re all set now to take the leap get pushing the cause and print art,banners, clothes you name it we want you to print it! Here’s a photo of my favourite corner in our house which I set up for the art’s crawl around Montpellier and St Paul’s. The painting is my reaction to how it felt at the first riot in Bristol, the confusion, fear, shock and helpless anger. Although it has been painted after the riot It also speaks about the aggressive suppression of civilians by states and governments around the world, the use of violence and fear to corner people into submission which has been witnessed time and time again. I have recently completed the largest reduction lino print I’ve ever made. Living Room was all printed using the suicide method of only one block which I printed eight times each time removing more and more of the block to leave coloured areas showing. 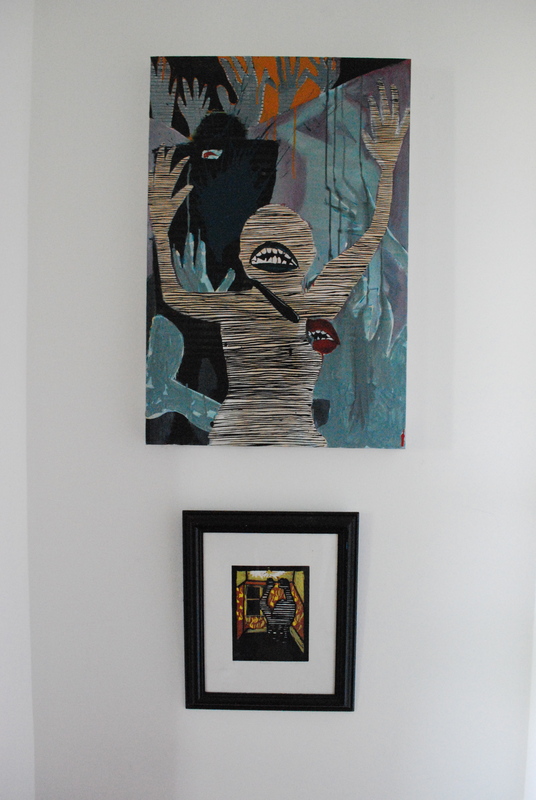 it is a semi abstract piece of work in which ‘Invisible’ figures begin to float freely out of there uncomfortable yet prescribed living room which, also reflects an external/internal environment with onlookers and pin ups, the people become monsterous and at the same time have lost control of themselves. If you want to know more about it please let me know and I’ll try to answer any questions, I am working on some more reduction prints at the moment and hope to mix iconic imagery with more popular and trashy colours. The photo of this print really does no justice to the colours and surface of the piece and it’s better if you see it for real which you can do if you come to my house for the Bristol Art Fringe Art Trail in which we will be opening our flat to the public and making an exhibition of prints, paintings and other art works including tea and cakes. I also hope to get the print ready for the spike open exhibition ‘Home’ curated by Theo Wood.